Michael Skinner, a professor of biology at Washington State University, ignited a firestorm of debate in 2005 when he and colleagues published a paper in Science describing how a brief, one-time exposure of pregnant rats to common agricultural chemicals led to heritable changes to their descendants, including great great-grandpups. The controversy arose around their assertion that these changes were not passed down through mutations to the DNA, but rather by changes to so-called epigenetic marks, such as small molecules that attach to the DNA and modulate how genes work. According to conventional dogma, all of these marks—with a few notable exceptions—are erased and reset twice while a fetus develops in the womb, so any acquired epimutations should get wiped clean in the next generation. Since that 2005 article numerous studies published by Skinner’s group and others have reported transgenerational inheritance of acquired characteristics, mainly in plants, mice and rats but also in flies, worms and other species. These findings beg an obvious question: Does the same phenomenon happen in humans? 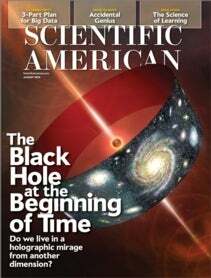 In his academic writings and an article in the August 2014 issue of Scientific American, Skinner says that the answer is almost certainly yes. Given the myriad aspects of biology shared among our species and others, he argues, these studies suggest that pollutants ranging from pesticides to jet fuel are partly to blame for diseases that appear even in people never exposed to the chemicals directly—people who simply inherited the epigenetic damage from their parents or grandparents. Other scientists have pointed out in scientific articles and in the press that many dots remain to be connected in order to definitively link the results on lab rats to the experiences of ordinary people. Virtually all of the rodent studies, for example, have administered the toxic chemicals at very high doses and by injection whereas humans are typically exposed to only trace amounts via the skin, mouth and nose. And laboratory animals are bred to be unnaturally homogeneous in their genetic backgrounds, diets and daily routines. If epigenetic inheritance does occur in much more diverse human populations, do its effects rise to a detectable level? Doing the studies to find out is fraught with difficulties, for both ethical and practical reasons, such as separating inherited causes from lifestyle changes and a plethora of other confounding factors. Perhaps the biggest challenge: transgenerational effects become clear only in the fourth generation, which for humans means connecting exposures of pregnant women to health problems in their great-grandchildren, some 75 years later. In the short video below, made by the Smithsonian Channel after he received a Smithsonian American Ingenuity Award in November, Skinner summarizes his thinking about epigenetics and the controversy he sparked.